The joy of earning billions...and pay no taxes! ... and had even crossed into the range above 0.11% where the BOJ traditionally launches its Fixed Rate Operation, also known as Unlimited Buying of JGBs beyond a given rate, something it did most recently on Monday morning (after a 7 month hiatus) when JGB yields also blew out sharply. Which is why we were wondering when the BOJ would announce the latest "unlimited buying" operation to defend Japanese bonds from a further rout. What time is the BOJ's Fixed Rate Operation aka "Unlimited buying at 0.11%" op today? And it wasn't just us: so were all bond traders and central bank watchers, and yet the hours passed and still nothing from Kuroda. 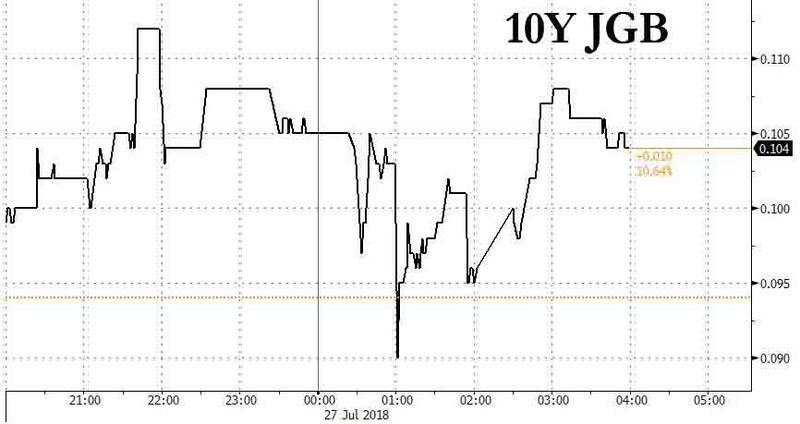 Then, finally, just around 1am ET or 4 hours after the rout had started, the BOJ couldn't take it any more and announced the long overdue fixed-rate operation for the second time in 5 days after the 10-year yield rose to its highest level in more than a year. While the BOJ's latest intervention resulted in a lot of relieved traders as the lack of any intervention almost convinced markets that Kuroda was willing to let the long end JGBs "slide", there was a difference: this BOJ offered to buy 10-year debt at 0.10% vs 0.11% at its previous operations. And also unlike Monday's operation, today the central bank actually did end up buying some 94BN yen worth of 10-year bonds. Commenting on the latest central bank intervention to prevent a bond market crash, BofA's chief Japan rates strategist Shuichi Ohsaki, said that "the BOJ probably wanted to demonstrate its capacity to be flexible by lowering the yield of its fixed-rate operation to 0.1% from 0.11%." He also noted that this move makes it likely there’ll be a tweak at next week’s BOJ meeting, and added that the "BOJ wants to send a message that the level for fixed- rate operation isn’t set in concrete." Others chimed in: "The operation is meant to cap the rise in yields and will help to weaken the yen," said Daiwa FX strategist Yuji Kameoka. Still, “the yen is unlikely to fall much, given policy doesn’t change until the BOJ’s meeting next week." "By offering to buy an unlimited amount of bonds at 0.10% in Friday’s fixed-rate operation, the BOJ is showing resolve to contain the rise in the 10-year yield, while also signaling its willingness to be flexible", said Takenobu Nakashima, quantitative strategist at Nomura Securities in Tokyo. If it had offered at 0.11% today, it wouldn’t have sent the message about flexibility; if the fixed rate was set as 0.12%, it would have given the impression the BOJ will let yields rise.